Forrás: Quartz. Szerző: Itika Sharma Punit, Suneera Tandon. For the past few weeks, jewellery stores and salons have been clocking up higher-than-usual sales in India in anticipation of Karva Chauth. Falling today (Oct. 19) this year, Karva Chauth sees Hindu women, especially in northern and central India, fasting from sunrise to moonrise for their husbands’ health. The practice often sparks a raging debate over its alleged regressive message—after all, there is no corresponding festival for the health and long lives of wives. But with Bollywood songs and movies lending the festivities a glamorous touch over the years, portraying the practice as the ultimate declaration of love, many women are often happy to spend big in preparation. 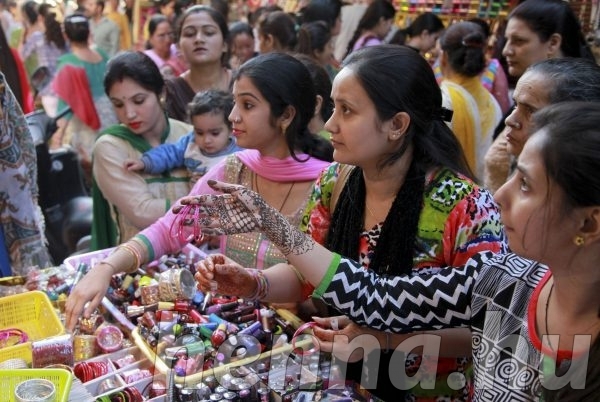 The result is extensive indulgence in new clothes, jewellery, trips to the salon, and henna tattoos—the last one deemed auspicious among married Hindu women. For Delhi-based doctor Charmy Bhardwaj, who got married recently, this is the first Karva Chauth post-marriage, making it special. So preparations began weeks ago. But Bhardwaj hasn’t booked her make-up appointment yet, which may be difficult now as most salons are already packed. For instance, all 104 clinics of skin-care chain Kaya around India are busy, with demand exceptionally high in states like Delhi and Punjab. “It is a big social gathering for some women, so they want to put their best foot forward,” Arvind RP, vice-president and head of marketing at Kaya, said. Ahead of this year’s Karva Chauth, the company launched new services such as laser skin-brightening procedures that cost between Rs5,000 and Rs7,000. However, it’s not just about clothes and grooming. The festival spells big-ticket sales for retailers, too. Over the last couple of weeks, online retail portal Shopclues has seen a significant surge in sales across women-related categories. “One of our biggest categories, sarees, tripled sales during this time,” a company spokesperson said. Gold chains and diamond bangles are high in demand at Delhi-based online and offline jewellery retail chain JewelsNext. The store has also seen an unusually high number of male customers over the last couple of weeks, mostly looking for gifts for their wives. The average spend by these buyers is between Rs25,000 and Rs125,000, according to JewelsNext director Gaurav Issar. They are splurging during a time when the demand for gold is subdued in India due to the government’s crackdown on black money. “The last six-to-eight months were very slow in terms of demand, but there has been an uptick for a couple of weeks now. This year, we were cautious about whether demand will rise around Karva Chauth or not, but it has happened,” Issar said. The three outlets of Dwarkadas Chandumal Jewellers in Mumbai have also witnessed a similar spike with mothers-in-law and husbands buying gifts for their daughters-in-law and wives, respectively, said Rajesh Tulsiani, co-founder of the company. “I have done almost everything that I was supposed to do. Now I am waiting to see what my husband gets for me,” Bhardwaj said with a sparkle in her eyes. Besides fixing her makeup appointment, there’s one more thing left on her list: getting her henna done, which is scheduled for late in the evening after she finishes all her chores. 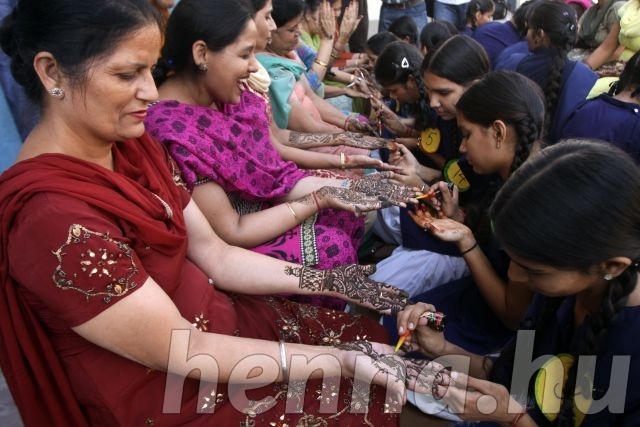 Henna artist Anuj Kumar began his day at 8 am on Oct. 18. Knowing full well what to expect for Karva Chauth, Kumar and his team of 10 artists were repared to work non-stop until 4:30 am on Oct. 19. For them, this festival means big business. The demand for henna is so high at this time that even ride-hailing startup Ola decided to cash in. The Bengaluru-based firm launched a contest, the winner of which will have a henna artist driven to his or her doorstep. For wives like Bhardwaj, that could make a big difference.